Let's all momentarily forget the fact that the Penguins power-play contributed to a shorthanded goal for the Washington Capitals Wednesday night. As frustrating as that brief moment may have been, the power play has been exceptional thus far, ranking near the top of the league. The Penguins have converted 15 of 62 chances, good for fourth in the NHL at 24.2 percent. A large part of that success can be attributed to the hot start of Sidney Crosby. 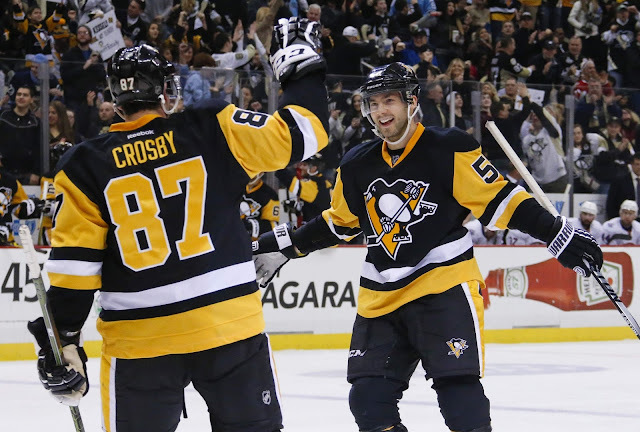 Crosby has tallied five power play goals this season. Patric Hornqvist, four and Phil Kessel has three. As a group, the Penguins have scored a power play goal in nine of their ten home games this year. They obviously have a power play unit loaded with talent, but sometimes simplicity is the best approach: get the puck in, get set up and blast away. The Penguins are moving the puck and getting traffic in front of the net. "One of the things that we like about our power play is the movement,” coach Mike Sullivan said last month as the Penguins were getting ready to play the Flyers. “That’s what makes it difficult to defend. We’ve had a lot of movement and that shot mentality." Sullivan also pointed to the Penguins winning opening draws on the power play as a factor for their success, allowing the Penguins to set up quickly in the offensive zone. According to puckbase.com, the Penguins are winning 57.3 percent of their offensive zone faceoffs on the power play. Crosby has won 24 of his 42 offensive-zone draws on the power play since returning to the lineup. Malkin has also won seven of 11 draws while Nick Bonino has won 11 of 21. It helps us to win that first faceoff to establish zone time. A quick loss on the draw can easily kill 20 seconds right off the bat. This video is a good example of all of these factors coming together. The Penguins win the faceoff back to Kris Letang. Letang plays catch with Kessel on the left point before Kessel moves to the circle. Letang moves it back to Kessel where he moves to SHOOT. Chris Kunitz is in front to control a loose rebound and Crosby is crashing on the backside and puts home a pass from Kunitz. Too often we've watched previous versions of the power-play be reluctant to shoot and force cross-ice passes through the box. Did you notice how spread out Buffalo was in that video? That's what puck-movement does to penalty killers. The scary part is the Penguins power-play could actually get better. Evgeni Malkin has just one power play goal this year. He's piled up points, collecting seven points on the man advantage. Once Malkin's booming shot starts finding the back of the net, the power play could become even more dangerous. Phil Kessel has also shown a reluctance to shoot at times from the left circle, preferring to pass instead. That's evident with his team-leading nine points the man advantage, and make no-mistake he's made some terrific plays this year. But look no further than above to see what a shot from the left circle can do. There's so much emphasis on the right half of the ice that teams overload that side to neutralize Crosby, Malkin and, at times, Letang. Kessel is that threat on the opposite side that forces teams to balance the ice. Once he begins pulling the trigger again. Malkin too, once those pucks start finding the back of the net. There's no reason to suggest these things won't start happening. And soon.